A vacuum pump is necessary equipment for many composite processing methods. There are a lot of choices and prices and ways to get your hands on one, and if you are doing large projects or commercial work, you’re going to want a few. This article discusses the options and my opinions on what the best choices are for different types of composites work. Why do you need a vacuum pump? First a bit about vacuum in general. Vacuum is just volume without air molecules in it, and the reason a vacuum bag presses “down” on its contents is that the atmosphere (air, sky, all the clear stuff up there) weights a whole lot. We don’t feel it because we are “pressurized” from the inside to compensate and our bodies are designed to handle it. If you go way up in the air in a plane, the plane is pressurized to approximate the way it feels on the ground. Lesson: don’t vacuum bag yourself and don’t go out in space without a pressurized suit. So when you pull the air out of a vacuum bag, the air outside presses down on the outside of the bag with its full weight, which is approximately 14.7 lbs per square inch. That’s a lot! We can measure the amount of air removed from a vacuum bag relative to the air outside (atmospheric pressure) with a relative vacuum gauge. If you remove only some of the air inside a vacuum bag, the atmospheric pressure only pushed with a fraction of the potential 14.7 psi. So you can adjust the vacuum level to tailor the pressure required for the job. Most vacuum pumps and gauges will use either torr, inches of mercury (inHg) or millibar. The capacity will be rated in cubic feet per minute (CF/M) or cubic meters per hour (CM/H) - this is a theoretical capacity. Most pumps can perform to their rating only at “free air” or no-load condition. As the vacuum level increases, the pump has to pull harder to remove air and the efficiency goes down. 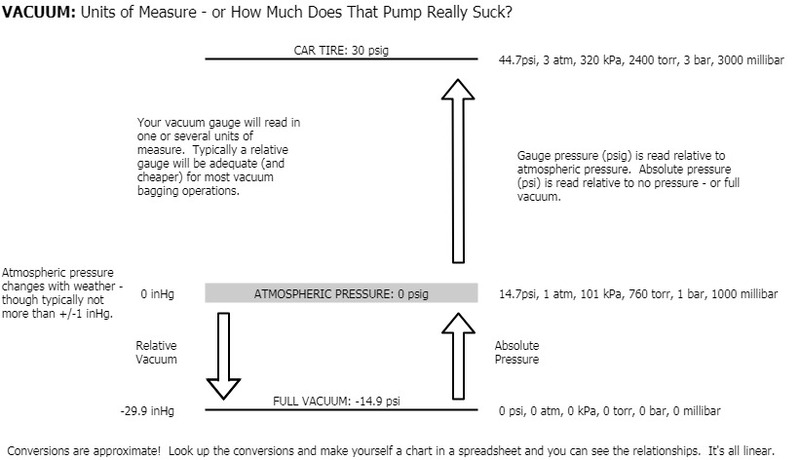 Be mindful of this as you look at pumps and be sure to ask manufacturers (or consult datasheets online) to get an idea how much drop to expect as vacuum levels increase. You are repairing a boat that was damaged in a collision and will need to vacuum bag some foam core and then several layers of fiberglass in epoxy. The bag will be about 25 square feet (2.5sq m.) and you need the do the job outside with a long extension cord. Here you don’t need lots of vacuum pressure, maybe only 15 inHg (500 mbar, 380 Torr) but the bag seal may not be perfect and a lot of it is overhead so you’ll want some capacity, maybe 10CFM or more. You could do with less, but if there are some leaks you could end up with less pressure than you need. Here a medium sized piston pump or diaphragm pump would be ok, but a nice dry rotary vane would be ideal. It will tolerate being moved around and can run on 110v (or whatever your wall outlet power is) and a 1.5hp pump will pull 20+ inHg at 15 CFM or so. I have a 110v Becker pump that I got from an online surplus site for $400 and it is perfect for this type of work. You are have built some small cored panels, assembled them into a box and are laminating carbon fiber biaxial tapes at the joints to tie the panel skins together. Total length of the joint is a few feet (1m) and you are using two 12 oz (400gsm) tapes. You don’t need much of a pump here - maybe 15-20 inHg and a few CFM. This is a perfect place for a small diaphragm, piston or dry rotary vane pump. I have had several fractional horsepower diaphragm pumps that use 110v power and have a little handle and gauge on top and they are perfect for this. New ones are several hundred dollars but they can be found on Ebay and surplus sites for less. They run forever and are relatively quiet. You are setting up a work-cell for a set of production infused parts with reusable silicone vacuum bags. The parts are not large, but you will be running several infusions in a rolling schedule and will be drawing down bags and shooting parts several times an hour with a resin metering machine. This is a situation where two pumps are ideal. The overall cost of the pumps will be small compared to the rest of the tooling and equipment needed, and the cost of losing vacuum or interrupting production is high. Often vacuum systems are set up with a high and a low vacuum manifold. The low vacuum (20-25 inHg) is plumbed to a high capacity pump (40+CFM) and is used to seat bags and to hold vacuum on parts after infusion is complete. The high vacuum is used before and during infusion and can be a smaller pump, but will most likely be an oil-lubricated rotary vane pump capable of pulling high vacuum (27-29 inHg.) In a production environment, high quality rotary vane pumps are a good choice. Oil-lubricated pumps require oil and filter changes and dry pumps need vanes replaced, but they can run for tens of thousands of hours with regular maintenance. You are running a small shop making prepreg automotive parts. You run a cook overnight and a small crew does layup and debulking during the day. Several parts are being debulked or bagged at any time and the vacuum demand is variable. For cooking, there needs to be enough volume to handle any moisture gracefully and as close to full vacuum as possible for optimal compaction. Debulking benefits from high volume to save time and high vacuum levels to really squish plies. In this case, the ideal pump would be a large (30+CFM, but maybe much larger) oil-lubricated rotary vane pump. None of the other options are going to cut it for pulling high levels of vacuum. You may even want a dedicated cook pump for oven (or autoclave) operation, and so you have a backup. Piston pumps are just like piston air compressors but backwards. Most can actually be hooked up as either compressors or vacuum pumps. They are simple and long lasting but don’t pull as much vacuum as a rotary vane pump. The ones I have used have been noisier that would be ideal, but they can often be found very cheap used. For small vacuum bagging jobs with wet laid material, a single phase piston pump would be fine. Diaphragm pumps are a lot like piston pumps except that they are often quieter. You won’t get super high vacuum from a diaphragm pump but small ones are portable and don’t have oil to deal with. Several companies make small ones that are handy for portable use. You can buy very fancy ones with multiple stages and high vacuum capacity but it probably makes more sense to buy a rotary vane pump if you are going over 1/2 HP. Dry (oil-less) rotary vane pumps are a great option for higher volume (CFM) and medium vacuum level - say up to 25 inHg. They can run continuously and are easy to repair. They are louder than oil lubricated pumps and that can be a problem if you are working in the same room with one all day - but there is no oil to spill or get blown out all over the room if there’s a big leak in your bag. If you can get one, this is the best option. For high vacuum work, it is the only really good way to go. These pumps spin a set of vanes in an oil bath, so they can reach a much higher vacuum level than the other types listed here. Getting a relative gauge up to 29 inHg or an absolute gauge down near 0 (millibar, torr, kPa) is very possible with a good bag, good plumbing and a well maintained pump. These pumps often have an oil filter (looks like a car oil filter) and an exhaust filter, which keeps the oil from blowing out with the exhaust air. When an oil-lubricated pump is run “open” with lots of air flowing through it, the oil can (and will) come out the exhaust in a fine mist. I recommend always plumbing the exhaust out of your work area (outside ideally) in case you have a bag pop or somebody forgets to close a valve. On more than one occasion I have seen a fog of oil mist fill a room. It is not healthy, and it is not good for all your clean oil-free work surfaces and materials. You’ll have to change the oil every few months (depending on usage) and if you are using materials that release moisture into the pump (cooking wood molds, etc.) your oil will get all frothy like a milkshake and you will need to change it. If you don’t change it and there is moisture, it will reduce the vacuum you can pull and also rust the insides of the pump. Oil-lubricated rotary vane pumps can have a “gas ballast” which is usually found on high vacuum pumps. This introduces a little bit of airflow that allows the pump to vent off water vapor or other contaminants coming out of the bag. It isn’t necessary or really all that helpful and pumps that have this feature are often too “high strung” for composites work and will fail sooner than a more standard duty pump. I killed off several nice units before settling on simpler more appropriate types of pump. What you choose to buy will have a lot to do with how much vacuum you need to pull, how much air you need to move and how much money you can spend. It is generally better to have too large a pump and one capable of pulling more vacuum than you really need - but you’ll run it a lot and it will use power. If you are a professional user, you will want to have more than one, and they can be tailored to different kind of work. It is also good to have a backup if you are working on expensive parts because many processes are guaranteed to fail without vacuum - it’s cheap insurance. Vacuum pumps are pretty simple and the technology hasn’t evolved much in several decades - at least at the low end of the vacuum range where composites processing hangs out. Most large and established brands can provide spare parts for older pumps and routine rebuilds are not difficult as long as you are careful. Buying a used pump can be a great choice, and knowing how to maintain it yourself is always nice. I have bought several pumps on Ebay, and on Craigslist and from online surplus dealers like HGR Surplus. Sometimes you get trash and sometimes you get a deal. Overall, there are lots of perfectly good pumps available at auctions and factory closings. Usually the place didn’t go under because the vacuum pumps were junk - but you take your chances. Looking for common and well supported brands of pump is a good idea. Also before you bid, try to call up the brand’s service provider in your area and see about parts availability. Buying new is a good option if you are in a commercial situation where the vacuum pump plays a critical part in the commercial success of your work. Given how expensive composites materials are and how much labor contributes to most parts, it is not a good idea to risk it all on some random pump from the internet. You’ll want support and parts, and probably you should get multiple pumps of the same model so you can have some parts and maintenance overlap. Now I’m going to name names. Over the years I have owned more than a dozen vacuum pumps and have dealt with many dozens more that belonged to friends, customers or employers. Some were total crap. Some were great - actually most worked very well until they were mistreated. First off, please don’t get one of those refrigerant service pumps from Harbor Freight. They work. They spew oil all over if you run them open, and they get very hot. They also pull pretty good vacuum. I know of one that has been degassing resin daily for 5+ years. Ok, maybe they are an option worth considering if you need high vacuum on a tight budget. I would rather see you get a used Busch off Ebay, but one of these for a backup wouldn’t be a bad idea. For small pumps, I have a Gast diaphragm pump that has served me well for eight years. It has a switch and a handle and pulls about 15-20 inHg and 1 CFM. It is perfect for little bags and repairs and dragging around on the end of and extension cord. Somebody also gave me a Gast piston pump that I re-gifted to a friend after tiring of the noise. It was probably 20 years old when I got it and is probably still going somewhere out there. My favorite size pump is the 1-2HP range. It can do small work all day long and if you’re careful you can infuse something 25 feet (8m) long no problem. I’d rather have two of these than one 5hp pump. My favorites are a Becker oil-less rotary vane pump and a oil-lubricated Busch RA 025. Both of them were bought used and for substantially under $1000. The Busch gets its oil changed now and then and the Becker I haven’t touched. Both are single phase. When I had a small factory, we had a few three phase Busch pumps that were slightly larger and they were very reliable and easy to deal with. As you get into bigger pumps, it starts to make more sense to buy new. If you need a 7hp vacuum pump for composites work, you have something going on and you probably know better than I do what you want. I have used larger Busch, Becker, Leybold and Rietschle pumps and they were all excellent. One company worth looking at if you are in a manufacturing environment is Vacmobiles in NZ. They don’t make actual pumps but they set them up on carts with manifolds and catch-pots. You pay extra for the convenience, but the concept and execution is excellent - I have always wanted one but been too cheap to get one! If you can’t afford their units, you can certainly use them for inspiration in building your own. Once you have that vacuum pump, you are going to need a bunch of other stuff too. There are a wide range of hose and gauge options as well as ways to get the vacuum into the bag. Vacuum leaks are a big problem, especially in the fittings and hoses in you vacuum system because they will be a constant drain on your vacuum performance. You want to use thread sealant on each assembly and buy decent couplers. I use brass (less corrosion than steel and cheaper than stainless) Parker ISO-B style couplers. There are lots of other better and worse options. Generally you get what you pay for! For room temperature use, heavy-duty air hose is fine for vacuum if you’re not shooting for high performance. You can often go to your local hydraulic hose maker and have them spec and crimp custom hoses for a surprisingly reasonable price. McMaster Carr sells a yellow vacuum-rated hose that works great at room temperature. For high temperature oven or autoclave use you will pay more money but its worth getting the right kind of hoses. Cheap hoses flatten and lose flow when you heat them up. I have bought high temperature cook and autoclave hoses from Torr Technologies and Airtech and both are very good. Torr makes some crazy rugged metal sheathed hoses - but I haven’t used them. In another article I will get into setting up a vacuum system and all the bits and pieces you will need to think about. If you are looking to get a first vacuum pump or to do simple vacuum bagging then a smaller oil-less pump - piston, diaphragm, or rotary vane would be a good place to start. For small shops or hobbyists looking for a good quality pump for either high (oil) or lower (oil-less) vacuum, a rotary vane pump is a good choice. Better to buy three used ones for $1500 total and have two that work than to spend $2500+ on one new one and not have a backup. Bigger pumps are available used too - often at even steeper discounts because they are huge and need three phase power. If you’re relying on a vacuum pump for your day-to-day commercial activities - or your boss asked you to buy one - it’s probably safer to buy a new one and the support and warranty that comes with. Get something common and high quality and then keep and eye out for a used one of the same model. Vacuum is where the rubber meets the road for a lot of composites processing techniques. Consider carefully the cost of even a single failed part, and bake that into your decision. Vacuum bags are an almost magical tool - you can press really hard on things in ways no other clamping mechanism can match. The amount of vacuum you pull is directly proportional to the pressure on your work so you’ll need a pump that lets you get what you need and more. Better to buy your second pump first if at all possible, and to round up a small collection if you do routine composites work. They’re like hammers - different types and sizes for different jobs!